Bali for a long time is well known as the island of Gods with its distinctive beauty, culture and tradition. It is also famous for it's lovely beaches, valleys, rice terraces and friendly smiling faces. The beauty of Bali has attracted people from all over the world to come and explore Bali in many ways such as vacation, business, incentives, meeting & conventions, medication, spirit and cultural experiences, sports and definitely private events like wedding! Getting married is one of the most important events in the life of most people. Both the bride and groom hope to keep an unforgettable memory of this day. Escape to Bali for a quiet and private ceremony, witnessed by close friends or family members in a lovely beach or mountain setting would be a rewarding experience. And we are proud to be a part of your most important moment in life. We always do our utmost to make your wedding dream come true. Attention to details is our priority to make everything runs as scheduled. 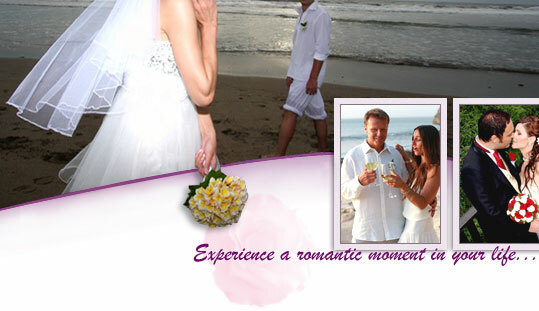 Having 8 years experience in wedding, Bali Nirvana Wedding is the most professional wedding organizer in Bali. We emphasize on personal services starting from the correspondences, the arrival, the pre-wedding meeting, rehearsal, the BIG day, after wedding services... all are done in both professional and personal way. So come and say, 'I do" under the sunset, surrounded by valley or bear feet on the sandy beach..
Filipa (Balangan Beach) "Thank you so much for organizing the most perfect wedding for us, a truly beautiful and breathtaking experience... a day that we will remember and cherish for the rest of our lives. Everything was done just perfect. Thank you again to Puri weddings and specily to Oka for making 'our' dream come true!"